So we often work with a local IT recycler. It’s become a thing whereby when anything odd or unique comes in, I get a call. One of these calls let me to a ton of Electronic Point of Sale Displays. These were trialled in a number of places over the world and never really caught on. The economics of the system were dodgy at best and now these units have aged a bit there are a few issues that in a retail environment could be an issue. If you’d like to read up on these a little and see how they work theres a little bit of info here. 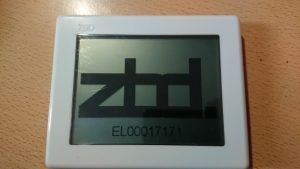 The display itself, even if it were an LCD would be worth saving, however its something more. The display is a bistable display based on Cholesteric technology this means once you have written to it, the display does not require refreshing by thge controller. This means your controller can write the display, then go into deep sleep using uA of power. This is ideal for things that don’t need to update that frequently and/of are running on limited power. The display isn’t grayscale cabable but the pixel size is fine enough to allow dithering. The displays are updated via radio and I was lucky enough to not only get the tranceiver, but the software as well and some demo software so I can write to these. And thats where the first two problems show up. First up, the Lithium primary cells are all but dead in most of these. They are simple 3V packs so its not a huge issue. Secondly, these seem to show an element of burn in. I have not found a solution for this yet so some of these retain the test image they came with. It seems to vary from unit to unit as to how much of an issue this is. Regardless I have a good stash of these and they are popping up on ebay, so finding out how to use them or at least recycle the panel, would be handy. I’ve had a little play with these before just poking about, but this post and the next few will document these things properly and see if we can’t find a structured way of getting inside them. From the inital play around I suspect the software is simply feeding a bitmap image over the air, the displays have a programming header and well marked test points so I was able to obtain some data during an update so the next step is to unpick what is coming in and how the software communicates. The next part will contain some images and a look at the display hardware.